The Downey City Library will be closed to the public for renovation starting March 18, 2019. We will remain closed until we re-open June 2020. During this time, patrons will have access to our growing collection of electronic resources, however all physical materials - including books, magazines, CDs, DVDs, Blu-rays, etc. - will be unavailable for checkout. Please see our Frequently Asked Questions section below for more details on the closure and renovation. February 22, 2019 - Last day to checkout books, CDs and educational videos (i.e., all items with a 1-week or 3-week loan period). March 9, 2019 - Last day to checkout entertainment Blu-rays and DVDs (i.e., all items with a 3-day loan period). March 16, 2019 - Last day open to the public. Please Note: All library materials must be returned by 5:00 pm March 16th, 2019 or fines may be incurred. After nearly 40 years since its last remodel, Downey City Library will undergo a complete renovation that will transform it into a true 21st century public learning environment, integrating needed features for current patrons and those in the future, including infusing technology through the building and opening access to information and experiences to everyone. The project will unfold over a 14-month period and result in the complete shutdown of on-site operations during construction. When will the library be closing? The last day the library will be open is March 16, 2019. When is the library going to re-open? The library will re-open to the public June 2020. Are you going to open a temporary library somewhere? Will patrons have access to any part of the collection? Yes, while patrons will not have access to any of the Library’s physical materials (books, magazines, CDs, DVDs, etc. ), all of the Library’s electronic resources will still be available. What if I can’t return borrowed materials before you close? Will I still be charged late fees? You can still return materials using the outside book drops in March and April. Fines and fees may still apply. Where are you going to keep all the books? The Library’s collection of physical materials will be stored in cargo containers near the library. Where are you [the staff] going to be? What are you going to do during the closure? Library staff will have office space in existing City-owned facilities or temporary trailers and will be doing extensive training to prepare them to serve the public in the new library. Staff will also be doing extensive outreach and programming in public spaces while the library is closed. Tutors will have to make their own arrangements on case-by-case basis. I need computer access, where can I go while you’re closed? The Library is investigating a possible site to relocate its laptop loaning kiosk while the library is closed. Also, neighboring libraries all offer free computer access. What if I need to check out a book? The Downey City Library will not be able to loan books, but neighboring libraries will gladly issue County library cards to Downey residents free of charge. eBooks, eAudiobooks and eMagazines will also be available via the Library’s website. Will there be a type of bookmobile? Will there be an inside cafe when the library re-opens? No, but the cafe located outside the north entrance will still be there. Will there be more study rooms? Yes! The new library will have four study rooms. What services will be available while the library is closed? Some toddler and baby story times, Summer Reading Program, National Library Week and other holiday events when and where possible. Wondering what the new library is going to look like? Take the virtual tour of the new library and see all the great new changes coming spring 2020! 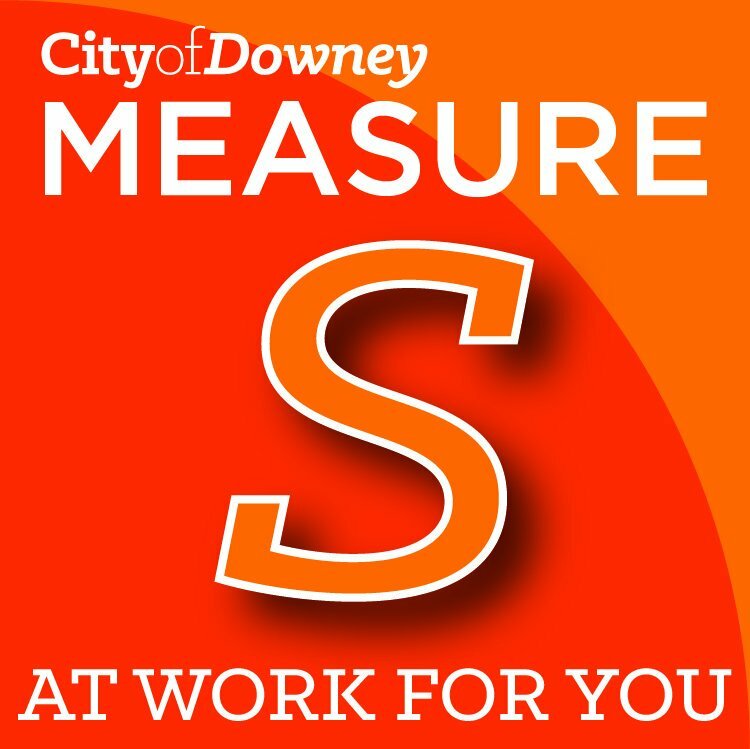 The current renovation of the Downey City Library is funded by Measure S. In November of 2016 Downey voters approved Measure S, which increased the transaction and use tax by 1/2 percent. This went into effect April 1, 2017, and is expected to generate approximately $9 million per year to protect and enhance the quality of services to the community. The Measure expires in 20 years and cannot be renewed without voter approval. For more information on Measure S click here.